Lisa Lloyd's book is here. Lisa is an amazing designer, spinner and now, writer. I've had a long-lasting love affair with Aran knitting and the sweater, sock and accessory designs in this book are exceptional, as are Lisa's descriptions and instructions. There's more: the layout and design of this book is the sweetest eye candy I've enjoyed in a long time. So enticing that I read the entire book, cover-to-cover, in one leisurely and thoroughly enjoyable sitting. I've never spun my own yarn and I'm not sure I will, yet I was fascinated by chapter two, The World of Handspinning Wool. It is an excellent primer on fiber, sheep breeds, the wool they produce, and the technical aspects of spnning. 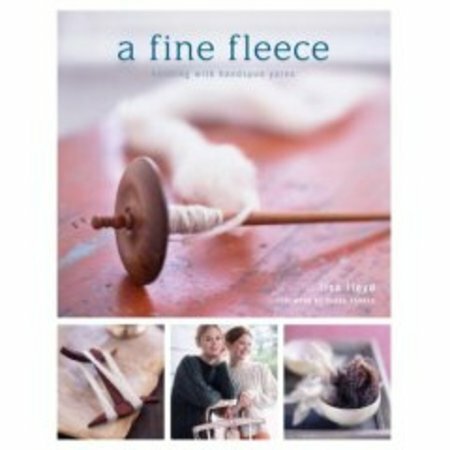 Again, I may never take up spinning, but as a knitter, I found this chapter both eye-opening and informative. Then there are sweaters. And more sweaters. And even more sweaters. That are so gorgeous I want to knit my way entirely through the book. Pullovers, cardigans and jackets with the most beautiful cable combinations I've ever seen. There's even a sock pattern that I've added to my to-knit list. I may even buy some handspun for those. The most valuable part of this book, though, is that each design was knit in Lisa's very own handspun (with details so you could, presumably, spin something similar) and a second model was knit as well, in a commercially produced yarn. It is really neat to see the two versions of the same sweater, side-by-side. The handspun versions really spoke to the part of me that loves the organic, homespun-yet-refined look. Now I must buy some Green Mountain Spinnery Maine Organic and get to work on "portland", on page 71. Or maybe I'll pick up one of these at Maryland Sheep and Wool in a couple of weeks and try my hand at spinning the old way. If these drop spindles really spin forever as Sarah claims, I just might get hooked.